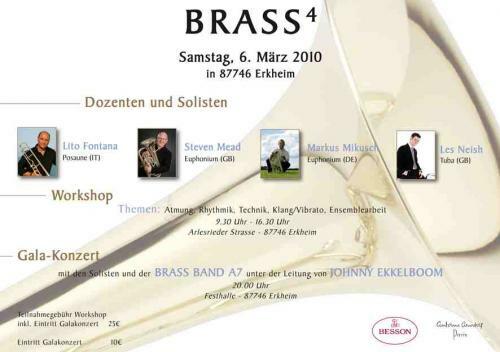 I just returned from a really good day in Erkheim, west of Munich, Germany where over 80 low musicians assembled for a days workshop and then an evening concert, organised superbly by Buffet Crampon/Besson and in particular by local Besson euphonium artist Markus Mikusch. My fellow artistes tubist Les Neish and trombonist Lito Fontana had a great day working with all the local musicians that it turned out despite the 8 inches of snow that fell during the night before! They know how to cope with winter conditions here.The workshop began at 9.30 am with breathing and stretching exercises that all three of us suggested to the students. We also sang and got our minds and bodies ready for the long day. We then divided into three groups, euphonium, tuba and trombone, the working on basic routines, tone production, range, articulation, flexibility... and so much more ! There was a lively and humorous attitude pervading for the entire proceedings and everybody was keen to learn. After lunch we rehearsed the pieces that we would conclude the day as a massed ensemble. I had selected the finale from Beethoven's Fifth symphony (arranged by Maurice Bale) and the same arrangers version of Gershwin's Strike up the Band. Several soloists also performed during the afternoon sessions and played duets with me for the most part. A high degree of musicality as well as good sight reading skills were displayed. After a short break myself and my fellow soloists appeared as soloists in the evening gala concert with the A7 Brass Band, conducted by Johnny Eckleboom. We were all impressed with the work of the brass band who accompanied the solos expertly. Despite the inclement weather around five hundred people attended the concert, exceeding our expectations. Given that this was the first workshop of its kind that we had jointly promoted it was declared it a tremendous success.